They say of a good painting that you can see something new in it every time you look. No doubt the same can be said for great architecture. 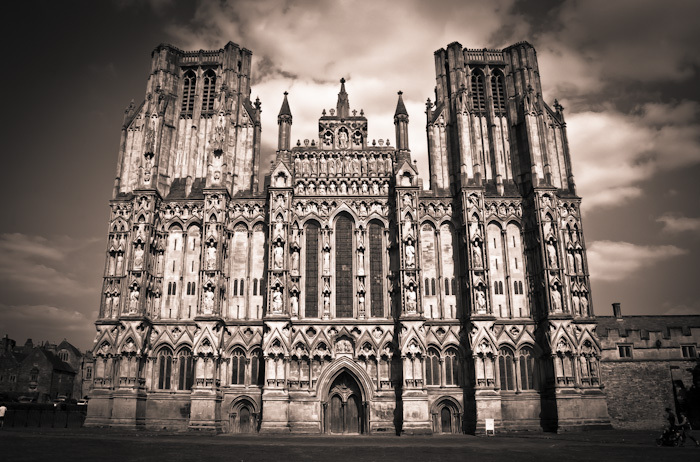 I don’t know how many times I have photographed Wells Cathedral, but it always seems to provide a source of inspiration, every time I visit it. Given that it took hundreds of people hundreds of years to build it, with great care and attention paid to every part, that is not an unreasonable thing. Perhaps one could spend a lifetime considering every element, every sub-work-of-art that makes up the whole. To the photographer, the structure and its many faces and close details offer abundant rewards in terms of the ways they can be approached and represented, via the initial shot and the post-production work: digital editing in this case, but no doubt a traditional darkroom photographer could find great interest here too. For those of a technical frame of mind, this was shot a couple of years ago on my very ancient Canon (I use Nikon nowadays) at ISO200, focal length 18mm (hence the steep perspective and curved base), f20 and 1/125th second. I think this shot shows what can be achieved with an old camera and limited pixels, if the subject and composition work.